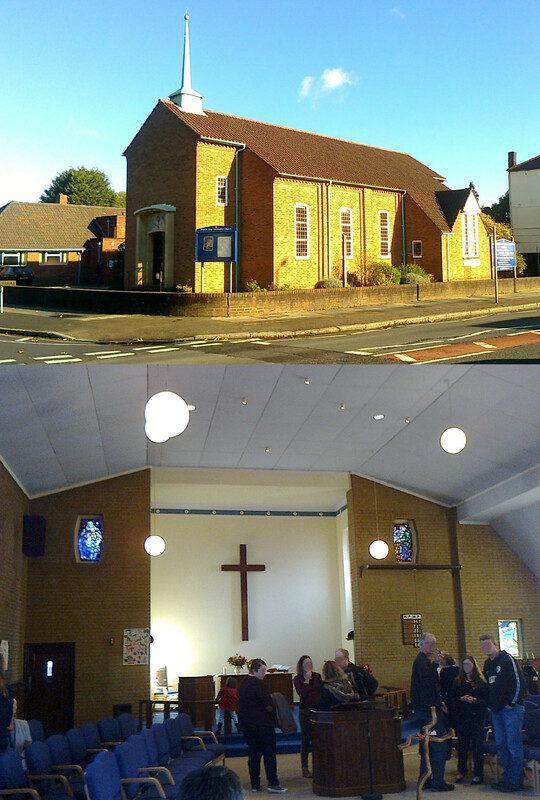 The church was founded in 1934, originally worshipping in a building that is now the church hall before the current church building next door was built in the 1960s. The church interior has a light, modern feel to it. Most of the decoration is at the front of the church, including a large wooden cross which draws one’s view towards the front. There are banners on either side of this cross, and smaller ones on the pulpits; these were green, which may have been due to the church currently being in Ordinary Time. 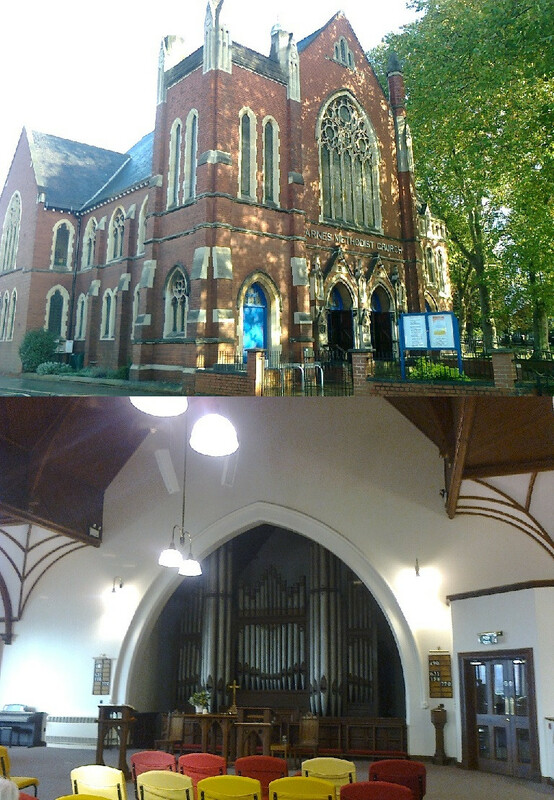 An organ is on the right hand side of the church, and notice boards at the back. There are no pews, but rather separate cushioned chairs facing the front. The hymn numbers are displayed on boards at the front, with hymn books found in the back of the chairs. The service was taken by a gentleman in a smart suit and tie, who was a visiting preacher. A lady from the congregation played the organ, and others gave the Bible readings. When I arrived, I was welcomed by some of the members of the congregation, who told me that they were mainly “old ladies.” The congregation numbered 33 people (not including myself), only six of whom were male and none of whom appeared to be below 35, most over 50. The congregation was predominantly white, with two couples of an ethnic minority. 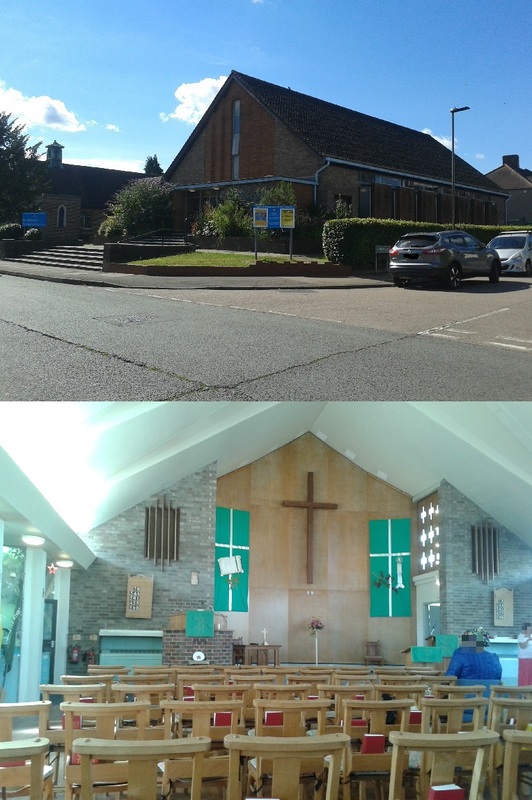 Several members of the congregation approached me before and after the service to welcome me to their church, and were very friendly. The service began at 10:30 with notices, and the preacher started the service with Psalm 107:1-9 being read with responses. This was followed by a hymn, and then prayers of confession and the Lord’s Prayer. The preacher then told the congregation a story warning about greed. After another hymn came the Bible readings (Colossians 3:1-11 and Luke 12:13-21) and the sermon, during which he quoted John Wesley. The theme of the service was about avoiding greed, and the preacher made the good point that if first century fishermen and peasants were warned about greed, how much more that warning applies to us today. Another hymn followed the sermon, after which a collection was taken. After this came prayers of intercession, and the service concluded with a blessing after a final hymn. The service lasted for an hour. Tea, coffee and biscuits were served at a table at the back of the church after the service. Most of the congregation stayed behind to talk over refreshments. The church was originally founded in 1861 on a site now occupied by a Roman Catholic church. Requiring expansion due to a rapidly increasing local population, it moved in 1911 to a larger church a few streets away, and then again only 15 years later in 1926 to a site next to the 1911 building, which now functions as the church hall. Major Sir William James Mallinson, Bt. provided a large amount of financial support for the growing church until his death in 1944, paying for the construction of the current 1926 building, buying its organ, and financing expansions to the church halls. The 1930s saw a period of great vitality and activity for the church, with its Sunday School reaching 360 children in 1932, but this “golden age” came to an end with the outbreak of the Second World War, with men called up for service and children evacuated. Church membership rose again through the efforts of the post-war ministers, but societal changes and the establishment of other local churches prevented the church from returning to the massive congregations it had seen in the 1930s. 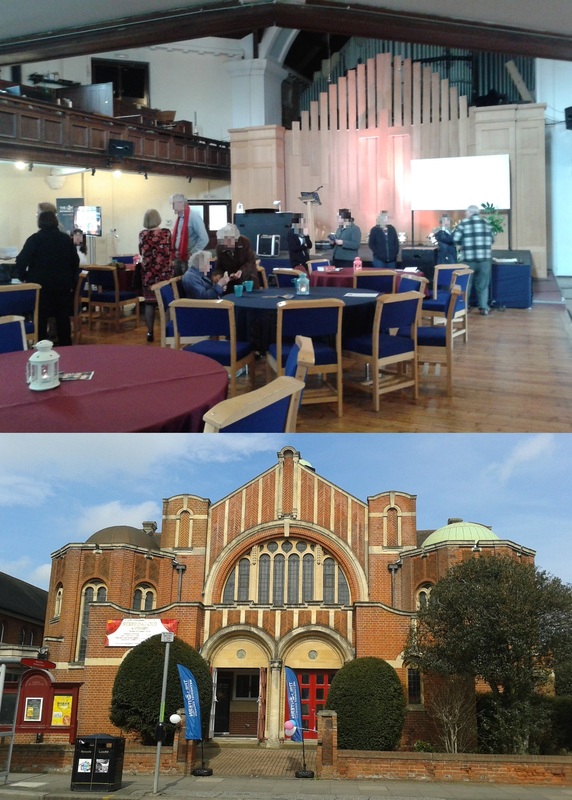 Cinema, dance and drama societies based on its premises help keep the church connected to the local community, and the church was host to Songs of Praise in 2010. The church has a white exterior with large arched windows and patterns in brown bricks. 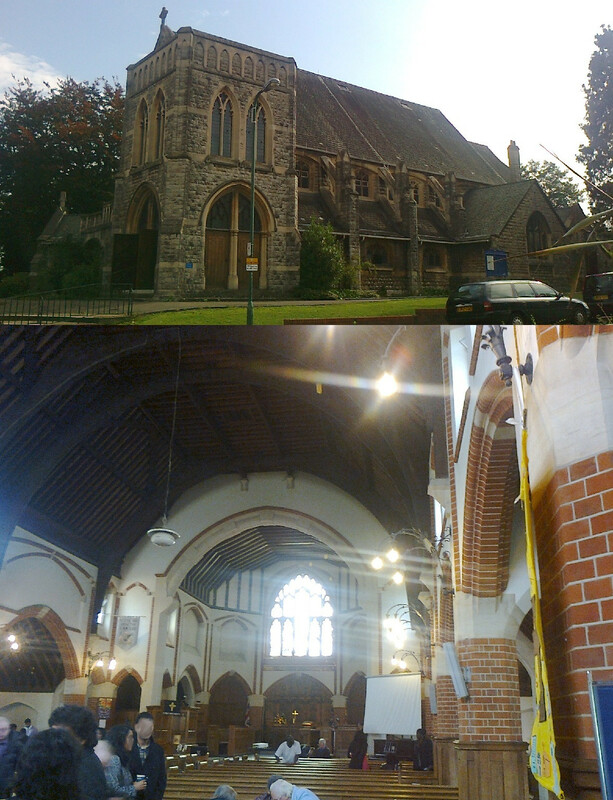 One could be mistaken for thinking that the church hall next to it, which has the exterior look of a traditional Gothic-style English church, is the actual church. This was what this building originally was (see above), and a spire was removed in 1926 to prevent confusion with the current church building. Inside, throughout much of the building there is little to suggest what its function is. Although there are some patterns in the décor here and there, on three sides the walls and windows are rather plain, as is the ceiling, with no religious images or objects. These are all at the front. In the chancel area stands an altar, with a wood carving of the Last Supper behind it, a table in front of it, and two pulpits on either side of that. To the right of the altar is a plaque listing the names of members of the church who died in the World Wars. Behind the altar is a simple yet elegant stained glass window depicting a large cross set over a picture of an open Bible paraphrasing II Corinthians 4:6 – “God commanded light to shine out of darkness”. A small baptismal font is hidden away in a corner, behind a piano. Also at the front was a projector screen, although this was not used during the service I attended, and a noticeboard displayed illustrations made by the church’s children. I found it interesting that I could only see the sign of the cross in two places – on the altar, and depicted on the stained glass window. Furthermore, the woodcarving of the Last Supper behind the altar was the only depiction of a Biblical scene – or religious imagery of any sort, for that matter – other than drawings of St. Paul’s journeys which had been made by the children of the church and pinned up on a noticeboard. Despite this, the church somehow managed to avoid having a particularly austere or minimalist feel to it. The service was led by a male minister, with Bible readings and some of the prayers said by four women who went up to the front from their seats in the congregation. There were no vestments, although the minister was smartly dressed in a blazer and tie. According to one of the church stewards, there were 73 people in the congregation for the service, including the four who went up to the front during it. Despite probably at least half being over 50, that left a good number below that age. I did notice that there were quite a few more females than males, probably at least a 3:2 ratio, and not many ethnic minorities (I can only recall seeing two people who were not white). Before the service, one of the church stewards read out notices and welcomed the congregation to the church. The service then began with a hymn, after which there were prayers led by one of the aforementioned women assisting the minister. Being the first Sunday in the month, this was a family service, with children staying in the service instead of going out to their Sunday school. The presence of several young children was evident in the talk with which the minister followed the prayers, in which he likened the call to be in the Kingdom of God to an all-inclusive invitation to a birthday party. After another hymn, there was a reading from the Wisdom of Sirach (Ecclesiasticus) – this surprised me, as Protestants regard Sirach as being in the Apocrypha, which is not included in the Bibles which could be found in the back of the chairs. The reading (10:12-18) was a warning against pride and arrogance, and although the minister mentioned that it was in a Methodist lectionary for today it was not really linked to the theme of the rest of the service, expounded upon in the sermon. The first part of sermon followed on from the theme of the earlier children’s talk, that is, that Christianity should seek to be inclusive, but also that Christians should try to avoid excluding others from their lives. After prayers, another hymn and an offering, there was a second reading, Luke 14:1 and 7-14. There followed the second part of the sermon, continuing to stress that Christianity must actively try to include more people. After more prayers and another hymn, there was a final reading (Hebrews 13:1-8 and 15-16) and more prayers before a final hymn and the dismissal. The service lasted for just over an hour. After the service, most of the congregation stayed behind to have tea, coffee and biscuits served at the back of the church. Following this there was a barbecue in the church garden, which I understood to take place after every family service in the summer, this one being the last barbecue of the year.